Overview - Teenage social outcast Peter Parker spends his days trying to unravel the mystery of his own past and winning the heart of his high school crush, Gwen Stacy. Peter discovers a mysterious briefcase belonging to his father, who abandoned him when he was a child, which leads him to his dad's former partner, Dr. Curtis Connors. The discovery of his father's secret will ultimately shape his destiny of becoming "Spider-Man" and brings him face to face with Connors, who becomes the vicious and vengeful Lizard. Too soon? I'll admit to more than my fair share of sour grapes when it was announced that Sam Raimi's 'Spider-Man 4' wasn't to be, despite the finished script, when Sony decided to reboot a franchise not even ten years old. Raimi's trilogy wasn't exactly the best, nor did it perfectly capture any of the characters, and, well, the third film was an atrocity (with blame being shared with the studio for shoe-horning extra villains to try to sell tickets...), but it was beyond successful (1.1 billion dollars in domestic earnings, including numerous records at the time of their releases). It was familiar. 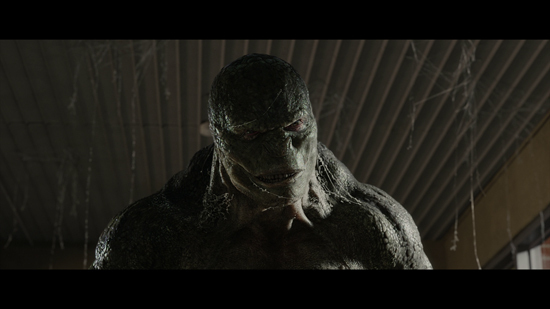 In fact, the plans for the fourth film would have finally paid off a long-running tease, with Dylan Baker's role as Curt Connors in the second and third film hinting at the film appearance of one of Spider-Man's oldest foes, the Lizard. So, with this reboot, we would bid Raimi adieu, along with Tobey Maguire, Kirsten Dunst, James Franco ("sooo good"), the late Cliff Robertson, three shades of Bruce Campbell, and the perfectly cast Rosemary Harris and J.K. Simmons. Usurping the iconic Raimi and his wealth of experience would come a man with only one feature film credit to his name, as Marc Webb was selected after his work on the romantic-comedy '(500) Days of Summer.' Real-life couple Andrew Garfield and Emma Stone would replace the somewhat hammy, over-the-top (and somewhat over-aged for their roles) Maguire and Dunst, and Rhys Ifans would get the role Baker had been primed for. I can't say that I was exactly excited to see the finished product, and it took me some time to get used to this new image, especially after years and years of repeat viewings of the original trilogy. The 'Spider-Man' franchise took a step back, financially, providing the lowest domestic earnings (including inflation and 3D ticket pricing) of any film in the saga by almost $100 million, but took a brave step forward by going back to retread an origin story we all know, while defying the odds and creating a truly inspired film that captures the spirit of the characters in a way we've never seen before. Growing pains, warts and all, 'The Amazing Spider-Man' is worthy of the title, both the adjective and the full name of the original comic series from 1963. In a clever mixture of modernization and respect for the well-known past, 'The Amazing Spider-Man' lays the foundation for what may be a spectacular series. The character of Peter Parker (Garfield) isn't as much of a high school reject as we once knew. He's a bit more troubled, though grounded and generally more an outcast by his own doing, an introvert who focuses on his studies and extra-curricular activities. After discovering some of his father's secret genetic formulas in a long-forgotten bag, Parker sneaks his way into a group of potential Oscorp interns as a way to meet Dr. Connors (Ifans), their head geneticist and former family friend. It's on this tour that Parker winds up where he shouldn't be, and gets bitten by a spider (a bio-engineered one, not one exposed to radiation), only to discover his own DNA is altered by the accident, giving him greater speed, agility, the ability to stick to walls, and a sense that warns him of incoming danger. That's where the similarities to 'Spider-Man' end for the most part. While Uncle Ben (Sheen) still meets his demise by the bullet of a fleeing criminal, the set-up is changed enough to feel like real New York. The origins of the costume are no longer cartoony, and the wrestling match that was found both in the comic and the 2002 film no longer even exists, though an homage to said origin is done in very classy fashion. Most importantly, the true origins for Spider-Man are made more mature. As Peter seeks out his uncle's killer, he comes across numerous thugs fitting the description, and decides to hide his identity after a close-call. His numerous attempts and failures to locate the fiend also leave him with a police rap sheet that makes the "friendly neighborhood Spider-Man" seem more like a menace, a petty thug than anything else, who has caught the attention of Captain Stacy (Dennis Leary). It's through this identity, as Peter struggles with loss through anger, that a hero is born, while a villain is also hatched, as Connors' quest to regenerate his missing limb causes him to become his own test subject, with disastrous results. The newly coined Spider-Man now has a chance to do right for his wrongs, as the city needs a hero to combat a reptilian menace. Once Peter is bitten by the cross-species spider (remember, no radiation...), the story takes off, and we're given a new vision, one that shows great respect to the origins of old with slight retouches that add a bit of modernism and believability to the character. The sequence featuring the discovery of powers, and the odd fascination and bewilderment, becomes an action set piece. The technology of Oscorp plays its hand a few times in the film, most importantly when their material is stolen by Peter to help create his iconic webshooters, following the original path of the comics, opening the door for some real danger when disabled or empty. More importantly, the webslinging isn't some talent that Peter instantly masters, as we see pratfalls along the way, even in the most dire of situations, lending more reality and urgency to the film. As the character that is to be Spider-Man emerges, we see the little bits of Peter's personality infused in the character, most noticeably in the smart-assed, sarcastic banter that shows the ego of the kid behind the mask. We see him struggling with his powers, and not just in some stupid cafeteria mishap, as Peter regularly forgets his newfound strength and destroys objects he didn't mean to. Heck, he even comes home bloodied and bruised from his odd little adventures, adding a sense of realism to the happenings. What's really interesting about 'The Amazing Spider-Man' is the way it makes Connors a character that we come to know and understand, more than we do Uncle Ben in his limited time. This seems awkward, but I felt it made more sense, since the 2002 iteration seemed like it was a film divided into distinct chapters, rather than maintaining a steady flow and story. We don't have lengthy transformation sequences for the villain, as story is the focus rather than effects, and it works, helping keep this extraordinary story grounded in realism rather than going off the fantasy deep end. The villain, who seems like a bit of the ol' Jekyll and Hyde, is one we care for, and his path mirrors Parker's from loss to gain, though it is twisted in a more tragic manner. 'The Amazing Spider-Man' came about for all the wrong reasons (the fear of the property being reabsorbed into Marvel's cinematic universe, wrestled away from Sony), but proves to be just the right kind of film for the character. I'm more than a little dismayed at how poor an Aunt May Sally Fields proves to be, but the rest of the cast really do sell their performances and characters, in some cases making us forget all about the past films. By the time the film ended, I found myself thankful rather than upset with losing Maguire's somewhat dopey Peter Parker and the prospect of a film featuring Baker as the lead villain, as Garfield and Ifans truly embody the characters. I'm now anxious for 2014, even if it means I have to stare at Garfield's ridiculous hair again for two hours. This reboot was worth it, and I can't believe I'm saying that. 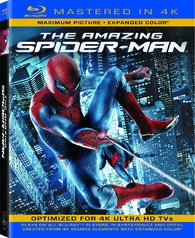 Sony previously released 'The Amazing Spider-Man' in separate 2D and 3D combo packs complete with a strong assortment of special features. This new version is part of the studio's "Mastered in 4K" series, and while the 3D version and all of the supplements have been dropped, a new higher bitrate transfer has been provided. Though actually not presented in 4K resolution, the 1080p transfer was sourced from a 4K master and has been optimized for upscaling on Sony UHDTV displays. According to the package, support for expanded color on xvYCC-compatible TVs and Blu-ray players has also been added. The BD-50 disc comes packaged in a standard case with a cardboard slipcover. An insert with a code for an UltraViolet digital copy is also included. Upon startup, the disc transitions directly to the menu, forgoing any trailers or promo clips. The packaging indicates that the release is region A coded. Considering how strong the last release was (the 2D version received a 5-star video rating from us) I really wasn't expecting to see any kind of an improvement from this disc -- especially since it's my understanding that the previous version was already mastered in 4K. Though I was a little surprised to discover that the two transfers aren't quite identical looking, for most users, the differences here will be negligible. Yes, the bitrate is technically higher (most scenes hover around the 30s as opposed to the 20s in the last release), but in motion I really could not detect any kind of discernible improvement. With that said, as the included screenshots demonstrate, there actually is an increase in apparent clarity and contrast in this transfer (though it looks like this was likely accomplished through artificial sharpening). It's much more visible in these shots than it is under normal viewing conditions, however, and once again, I want to reiterate that I could not detect any major differences between the two as I switched from source to source on my HDTV (even in fast moving scenes which usually benefit the most from increased bitrates). In fact, it was only after capturing the screenshots that I noticed any differences at all. 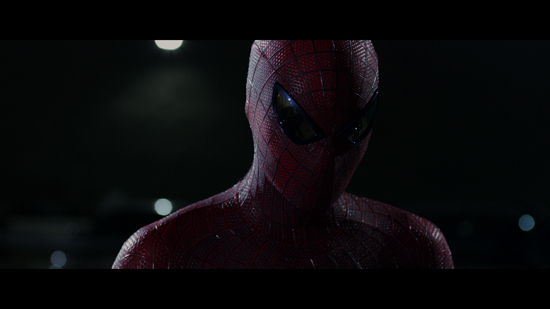 Presented in 1080p (with an AVC MPEG-4 encode at 2.40:1), 'The Amazing Spider-Man' surprised me with its visuals. I was so used to the Raimi films, which featured candy coated bright colors and lots of daylight, that it took me some time to get comfortable with the constant gloom that lingers over this film, this isn't meant for Saturday morning viewing. Once I got my bearings with the change in visuals, though, I came to appreciate this as one of the best looking Blu-rays on the market, in a somewhat subliminal way, as the picture isn't at all "in your face" with how truly amazing it is. The credit goes to the RED camera system, but more specifically, the RED Epic, capable of filming 3D picture at 5K resolution. The picture is stable and constant from start to finish, so you won't hear me say the opening half looked like this, but the closing half looked like that. This is wall to wall greatness. Textures are perfect, utterly perfect, as furniture, skin, clothing, hair, lizard scales (that one I don't get to use all that often!) are all so lifelike, so real, you can't help but rationalize the film as real, too. The depth of picture, naturally, is astonishing, from the top down looking at the floor or from standing level looking at the distance, even in 2D the picture is deep, deep, deep (no better way to say it than to say it three times). The amount of character and detail on display is amazing, even in the darker shots, like the grimy sewer sequences, which bring their own level of beauty to the picture in an icky kind of way. When the Spider-Man suit is finally unveiled, the texture, the detail, and the way it gets dirty and muffed up, it's a character of its own. What's really impressive, though, is the way special effects are seamless in the picture, as not a single moment stands out, not to emphasize "hey look what we can do!" or even in a negative light, where an effect fails and draws the eye. Aliasing is never visible, not in the tightest checkered shirts, not in the sharp windows of the skyscrapers in the NYC sky, not in any of the Lizard's scales, Gwen's fine blonde hair, or the sharp ridges in the Spidey suit. There is no sign of artifacting or banding, edges are extremely crisp, white levels are enough to put Mr. Clean to shame, and there isn't any bit of information lost due to crushing, no matter how dark the picture gets. This isn't a glossy, shiny film, but it's still visual perfection and demo worthy from start to finish. A real master constructed this disc to make it look this good. 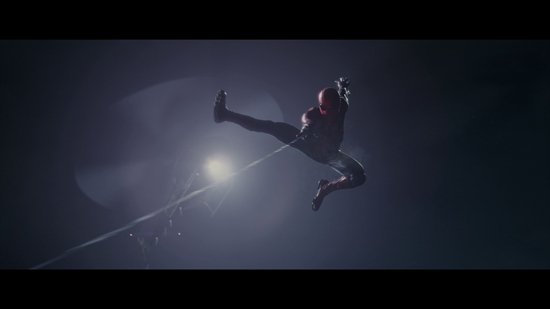 'The Amazing Spider-Man' has a fantastic DTS-HD Master Audio 5.1 track. Really, it's swell. It just isn't as overpowering, attention grabbing, or even as system testing as I'd expect from a tent pole franchise. I like the warm, in your face dialogue, the amazing localization and movement effects that keep us in the midst of Spidey's actions, and I was really wowed by how much work was put into making webslinging not just a visual aspect of the film, with swoops through channels accented by bass that sells the speed the action takes place at. The gunfire in the film is top notch, too, and the action sequences really are designed like miniature masterpieces. But, and this is a big but, this disc lacks something, that presence that keeps you engaged at all times. Not only is the subwoofer used somewhat sparingly, the score and soundtrack (ugh, the soundtrack...) don't grip from the rear channels, and environments aren't anywhere near as busy as one would expect from the most populated city in America. Yes, atop the skyscrapers we get a slight authentic busyness that's to be appreciated, but it's rare in this film, that enveloping effect that really puts you in the moment. That's something that only the best sounding discs do. Unfortunately, this "Mastered in 4K" disc is barebones, dropping all the extras that were found on the previous releases. The 'Amazing Spider-Man' is a great example of a comic book reboot done right, differentiating itself just enough from the prior installments to carve its own identity. This "Mastered in 4K" disc from Sony offers a higher bitrate transfer, but outside of screenshot comparisons, I found the differences to be nearly invisible under normal viewing conditions. The audio track from the last release has been preserved here and it's still fantastic. Unfortunately, none of the extras have been ported over and there is no 3D option. Those who own large projector screens or actual 4K displays might find some value in the slight improvements here, but for most, there really is no need to double dip.